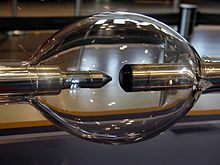 High-intensity discharge lamps (HID lamps) are a type of electrical lamp which produces light by means of an electric arc between tungsten electrodes housed inside a translucent or transparent fused quartz or fused alumina arc tube. This tube is filled with both gas and metal salts. The gas facilitates the arc's initial strike. Once the arc is started, it heats and evaporates the metal salts forming a plasma, which greatly increases the intensity of light produced by the arc and reduces its power consumption. High-intensity discharge lamps are a type of arc lamp. High-intensity discharge (HID) lamps make more visible light per unit of electric power consumed than fluorescent andincandescent lamps since a greater proportion of their radiation is visible light in contrast to heat.